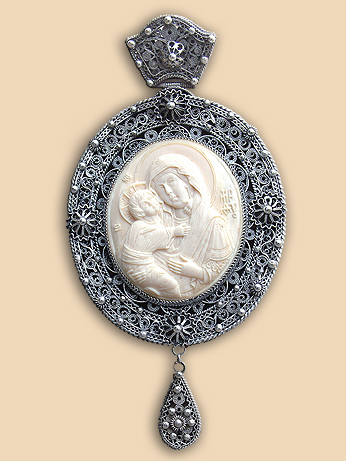 Bishop's panagia in silver filigree with hand carved Mother of God in mammoth tusk weighting 25.8 grams. Part of a set which includes pectoral cross NK012 and bishop's staff ZL004. Material: silver 950, mammoth tusk. 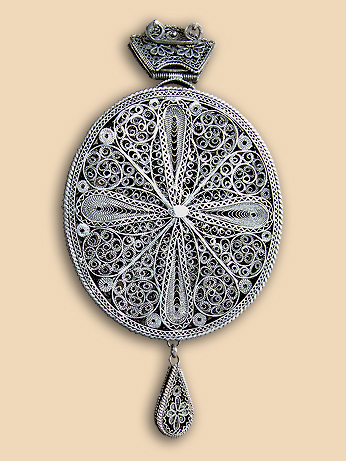 Weight: panagia 120 grams., chain 66 grams. Commissioned by: Priesthood of St. Sava Temple in Kraljevo. In possession of : His Grace Hrisostomos (Stolic), Bishop of Zica.